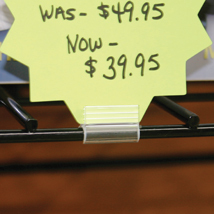 Great for Price Cards, Signs and More! Grid Sign Holders have gripping ribs to hold signs in position. 1 in. long and fits on any .250 diameter wire. Sold in a pack of 10.